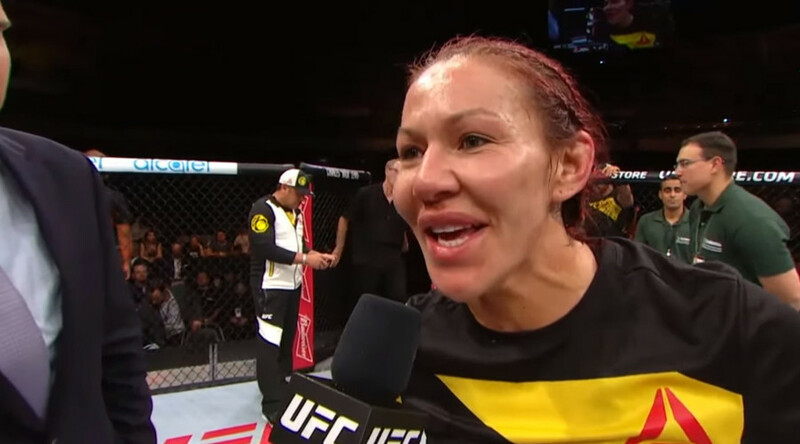 Cris "Cyborg" Justino set her sights on Ronda Rousey after another dominant victory, this time over Lina Lansberg at UFC Fight Night in Brazil. Cyborg defeated Lansberg by TKO at 2:29 of the second round with a flurry of brutal punches on the ground. "I want Ronda to come back," Justino said. "I think she should show people even when you lose, it's not the end of the world. You cannot give up." "Come back for your fans and let's make the fight for all the fans, for women's MMA. "I think everybody wants this fight and it would be amazing." Cyborg broke Lansberg's nose with a punishing right hand at the beginning of the second round, after landing numerous shots to the head of her opponent at the end of the first. Lansberg tried to cover her face up after damaging her nose, but Cyborg's relentless attacks saw the referee step in to save her from further punishment midway through the second round. 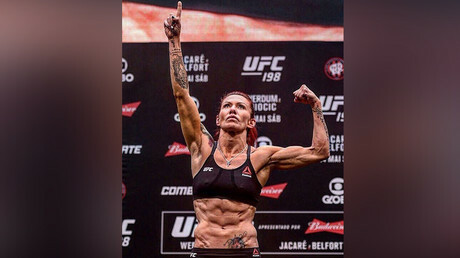 One of the major talking points ahead of the fight was Cyborg's rapid weight loss, with the Brazilian star forced to shed over 20 pounds in under a week to make the 140-pound limit. Cyborg looked dead on her feet at the pre-fight weigh-in and pressure is mounting on the UFC to create a new weight category for the 31-year-old. A match with former women's bantamweight champion Rousey would be a major box office attraction, but with both fighters having previously struggled to make the 140-pound limit there are likely to be further calls for the UFC to address the situation. UFC president Dana White predicted a year ago that a super fight between Rousey and Cyborg would shatter the all-time pay-per-view record with $2 million buys and he appears keen to make it happen. "When she does return, I'm sure Ronda is gonna want to fight for the title, probably defend it and then maybe fight Cyborg," White said. "We'll see how this thing plays out." "The dream fight for Cyborg is obviously the Ronda Rousey fight, but there's other big names out there like Miesha Tate, Holly Holm and possibly — and I know Brazilians don't like seeing Brazilians fight — but possibly Amanda Nunes. "I think that Cyborg has made it clear that she can't make 135 pounds. We do have a couple of really good girls at 135 that would like to fight Cyborg, that would like to move up and take that challenge." "Cyborg is a huge star in the sport of mixed martial arts and in women's MMA. She mows people over very quickly and very violently. "People are waiting to see her get challenged, and we're trying to challenge her."